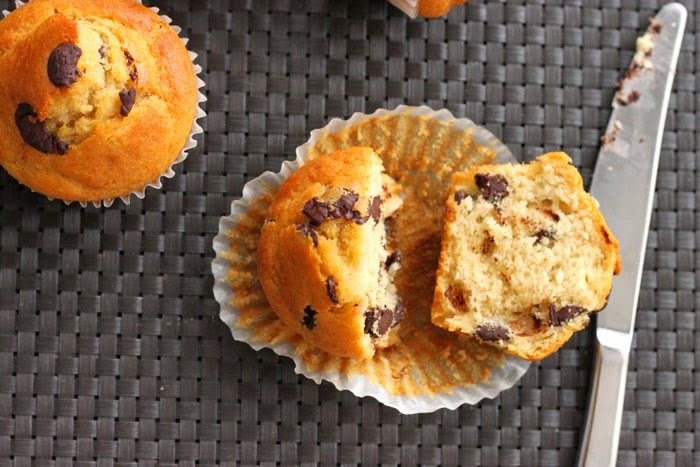 I know why everyone loves a muffin - it's portable, it's satiating and dang easy to make. You know I'm always harping on about how butter rules. Butter is better, no question. BUT, if there were ever an oil that could hold a candle, it would be olive oil. Olive oil is rich, intense and has body. Exquisitely enough, olive oil also matches very well with very dark chocolate. It's those peppery, citrusy, fruity notes that complement the bitter, roasty, yet also fruity notes of the darkest chocolate. This recipe is easy as it should be. 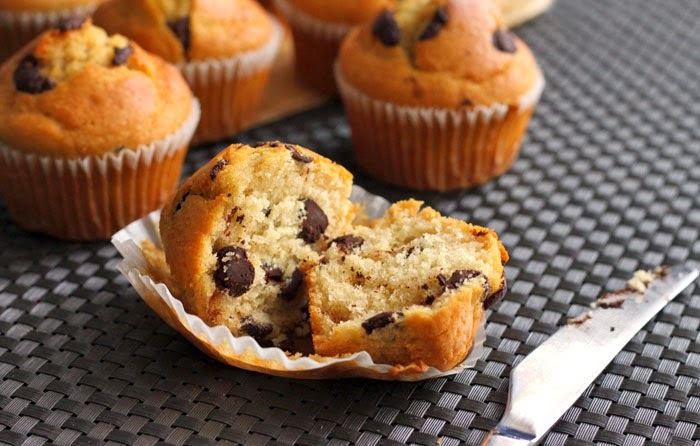 A muffin makes use of two bowls - one for the wet ingredients and one for the dry stuff. Ultimately the two mixtures are combined to form a relatively thick and maybe slightly lumpy batter. This simple technique is applied to "quick breads" which includes loaf cakes, such as banana bread, as well as scones and biscuits. The latter use an extra step of some careful cutting of cold butter into the dry ingredients before the wet stuff is added. We sift flour, leavening agents and a surprising bit of cinnamon in a bowl. 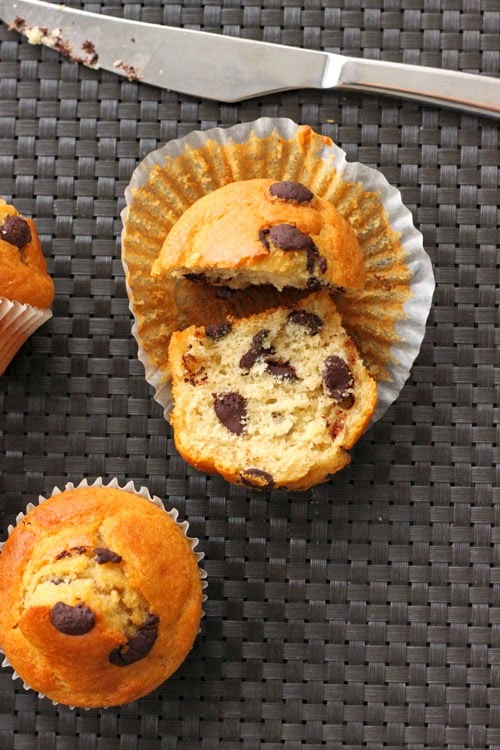 Cinnamon adds even more interest to this not-so-typical muffin and it's fruity spiciness just makes sense here. Add the sugar and salt and whisk it through so that we have an evenly blended mixture of dry ingredients. Toss through the chocolate chunks. I like Lindt 70% or Barry Callebaut 72%. In another bowl we whisk together yogurt, olive oil, milk, eggs and gorgeous vanilla bean paste. Easy does it as we add this wet mixture to the dry mixture and whisk just until smooth - no need to overdo it here. 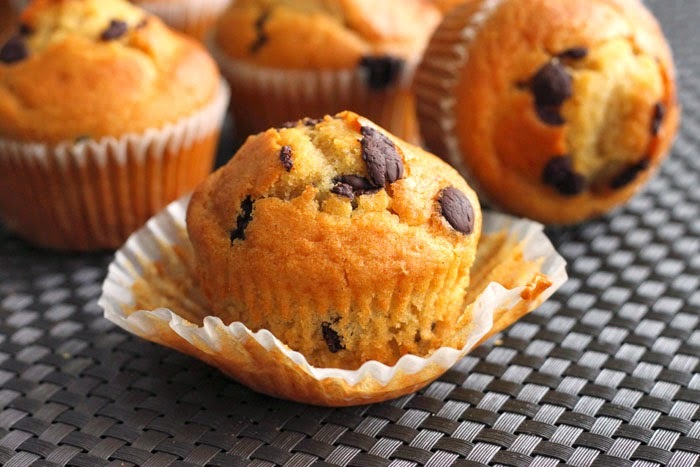 Muffins are very susceptible to over-mixing, so keep a light hand and you'll be rewarded with a soft but sturdy crumb. You could fold in the chocolate pieces at this point, but that would mean more mixing. So, combining them with the dry ingredients at the get-go provides more insurance. Eat them warm - that is the best ever. Then store the rest in a container for tomorrow. It's an easy way to start the day. Preheat your oven to 200°C. Line a standard 12-cup muffin pan with paper cases. Sift flour, baking powder, baking soda and cinnamon into a large bowl. Add sugar and salt and whisk to combine. Toss through the chocolate pieces. In a separate bowl, whisk together yogurt, olive oil, milk, eggs and vanilla bean paste until blended. Add to the bowl with the dry ingredients and whisk until just smooth and free of any large lumps. Do not over-mix. Divide batter evenly among muffin holes, filling them right to the top. Bake for about 20 minutes or until a toothpick inserted into the center comes out clean. Yum - They look great! 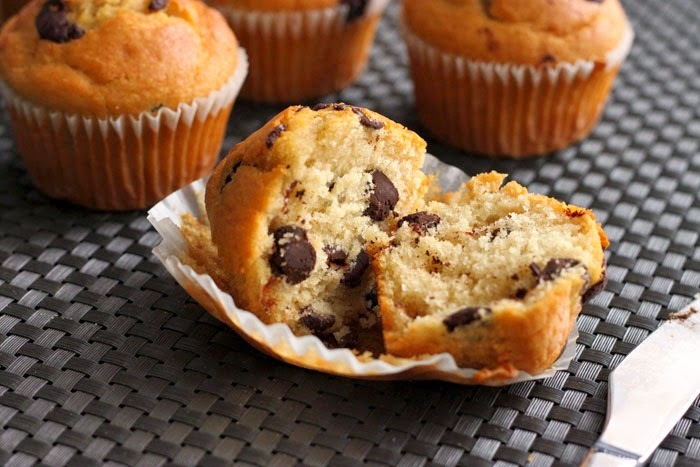 I love chocolate chip muffins. Thanks for sharing!